Select the annotations you want to include in the printout or the new file to be saved. If you do not select annotations, the original file will be printed. Export annotations and annotation rows using a number of our templates to further process your takeoffs. Select annotations and annotation rows first, then click on export and select the export template. You can export in two different ways. Either you download a .CSV (semi-colon separated file that openable by most spreadsheet applications) or you choose to copy to clipboard and paste it where you want it. 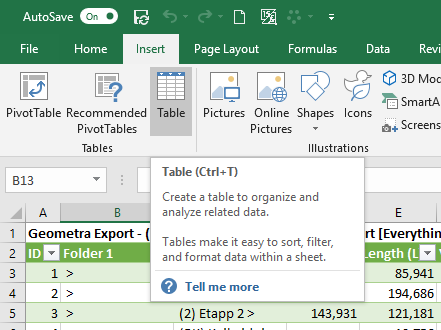 All the exports used in this guide are available to view and play with in this example file: Guide Export Example English We’ve used the “Table”-function in Excel to create filter and sorting for these examples. This export will poll all data from your estimate and summarise it per folder based on the folder structure of your estimate. A very useful export when you’re looking to find data in a broader scope like for instance quantities on apartments, buildings, phases or floors. A classic value is the GTA (Gross total area). The Annotations export is suitable as a overview of the selection of Annotations you’ve made. The export represents so called “raw” quantities for the Annotations you’ve created in the estimate. These lack linked values and content from the Annotation Rows. Just as the Annotations export the Annotations (Net) is a selection-based export with the main difference being that only the net values are returned. This makes this export slightly more limited but can serve as a good way of quickly creating an overview of quantities. Removing another level of data from the Annotations export this will remove the folder path structure you’ve created in your estimate. To create very rough overviews of an estimate this is a suitable choice. Annotation Rows is a complete export of all data from your selection. This will not summarise your rows which gives you a great way of inspecting your data set for irregularities. This is a great export to use when combing through data to find thing that might be slightly off. This is very similar to the previous Annotation Rows export with the key difference that all rows in the selection are summarised based on their unique values. This works well to get totals for your estimate in a quick and easy overview. RECOMMENDED! 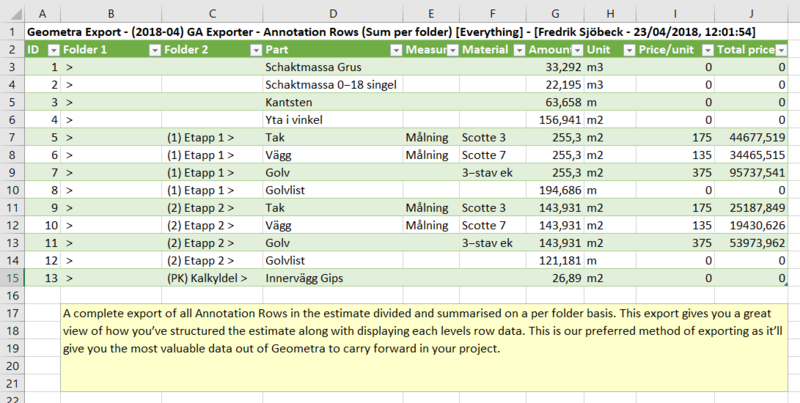 A complete export of all Annotation Rows in the estimate divided and summarised on a per folder basis. 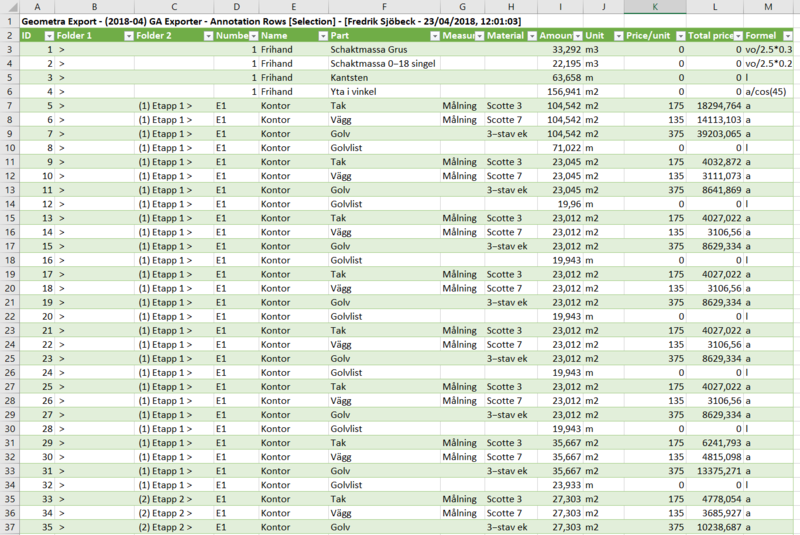 This export gives you a great view of how you’ve structured the estimate along with displaying each levels row data. This is our preferred method of exporting as it’ll give you the most valuable data out of Geometra to carry forward in your project. 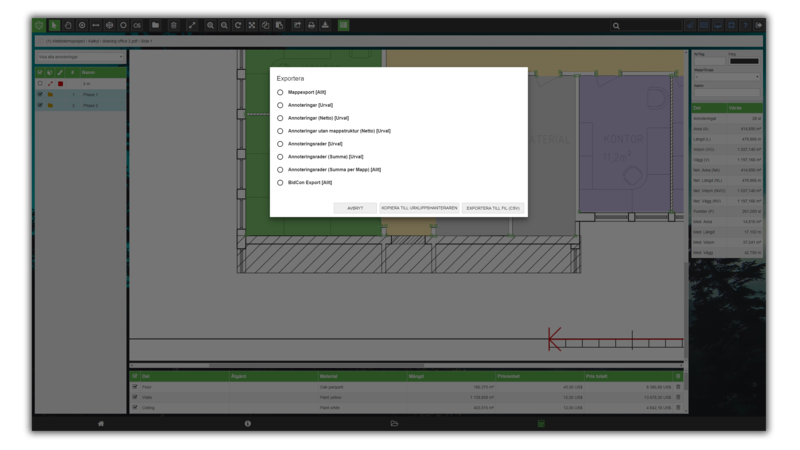 Together with Elecosoft Consultec we’ve developed a first version of your export to BidCon. By using specific fields in Geometra you can automatically match fields in BidCon through an import template. This export is preferably used as a .CSV export as the file can be directly imported into BidCon via their file import. The following setup displays how fields are matched between the two applications.